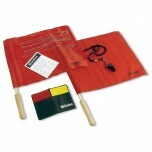 The basic volleyball starter package includes flags with wooden handles plus a net setter. The Elite Kit includes flags golf grips and a carrying bag (but without the net setter). 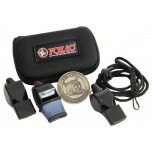 Both include warning/penalty cards plus whistle and lanyard.